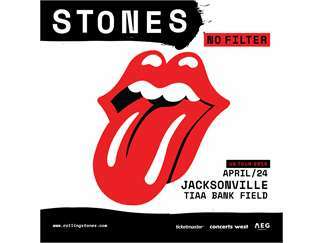 The Rolling Stones will bring their hugely successful NO FILTER tour to Jacksonville, FL on April 24, 2019 at TIAA Bank Field. This will be the first time The Stones play in Jacksonville in nearly 30 years and the stadium is one of only 13 cities across America the band will visit in 2019.The tour follows NO FILTER dates this past year that have taken Mick Jagger, Keith Richards, Charlie Watts and Ronnie Wood back out on the road amassing rave reviews as they played to sold out stadiums throughout the UK and Europe. Tickets for these dates will go on sale Friday, November 30 at 10AM. For ticketing information please visit rollingstones.com.